When the Sarjeant Gallery advertised the newly created position of Registrar earlier in the year, Te Maari Barham, jumped at the chance to apply. She knew the Sarjeant team well after working on the transition project that moved the entire collection from Queens Park to Taupō Quay. “Those 21 months were an amazing opportunity; working under Jennifer [Taylor Moore] I learned so much about collection management,” Ms Barham said. At the time she applied she was working in her hometown, New Plymouth, as an Information Officer for the Govett-Brewster Art Gallery and Len Lye Centre, talking to visitors, guiding tours and gaining front of house skills. She had completed her Bachelor of Arts in Art History at the University of Auckland several years earlier and had worked in New Plymouth, Auckland and Whanganui holding a variety of positions in galleries and museums. 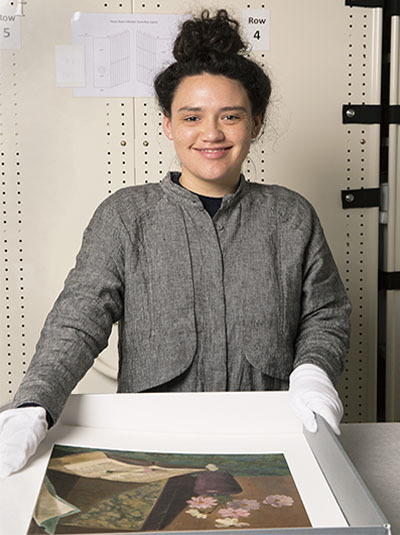 Ms Barham, 31, of Ngāti Tūwharetoa and Ngāi Te Rangi, has built valuable experience in the industry, initially working as a summer intern at Puke Ariki museum in New Plymouth where she worked in many different areas, including the Taonga Maori collection and museum archives. A later role at Puke Ariki involved working on a large pictorial collection project, followed by a position as Collection Assistant at the Maritime Museum in Auckland. In Whanganui Ms Barham got to know at very close quarters the collections of both the Sarjeant Gallery and the Whanganui District Council Archives, helping to pack and track the works when they moved, so she was well placed to help out the Whanganui Regional Museum with their collection move in 2016. As Registrar at the Sarjeant she organises and administers loans from the collection and any borrowing of works from outside sources. She also assists with exhibition installations and works closely with curatorial staff Jennifer Taylor Moore, Greg Donson and Jessica Kidd. And there is always scope for creativity and problem solving in gallery work. Her favourite artwork is Tom Kreisler’s Dancing Dogs which she “fell in love with” during the collection relocation. Kreisler was a much loved art figure in Taranaki who had moved, in his youth, to New Zealand from Argentina. And this latest move for her seems to be a good one. “I love Whanganui – it’s such a nice community and there’s lots to do. The Sarjeant has an amazing collection of artworks that I’ve already spent time with and I know quite well so it’s nice to have the opportunity to come back here. The Sarjeant team are close knit and everyone gets on really well. It was relatively easy to just slot right in. It feels like I never left.